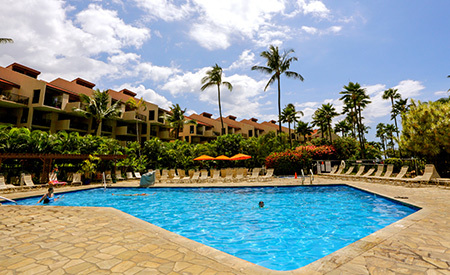 Kamaole Sands is considered one of the most popular complexes on South Maui, with resort-like amenities such as freshwater ponds, Hawaiian flora, tennis courts, and mesmerizing fountains throughout. The property is nestled on 15 acres, where you get free access to four tennis courts, a gym, a large pool surrounded by greenery, two jacuzzis, a children’s pool and gas BBQs. Directly across the street is Kamaole III — one of Maui’s premiere golden-sand beaches. It’s also walking distance from the Kihei Boat Ramp, where a variety of water activities await (tip: it’s faster to Molokini Crater and Turtle Town than Maalaea Harbor). Restaurants, shops, farmers markets are also nearby.